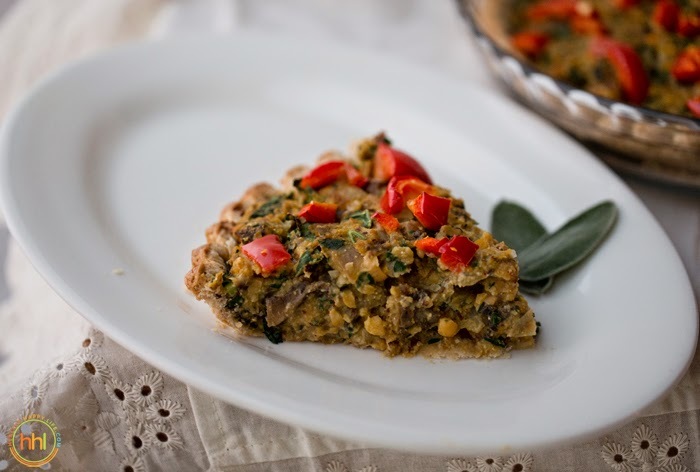 This Mushroom-Sage-Hazelnut-Chickpea Tart is your vegan main dish for your holiday season dinner. Christmas-approved recipe. The number one question I have been getting lately is "Kathy! 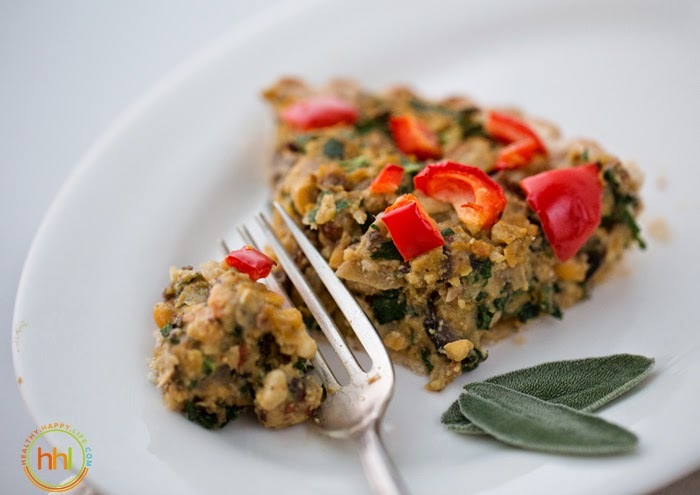 I really want an amazing vegan main dish for Christmas dinner, any ideas for me?" My usual answer is to refer you guys to my entrees section of my recipe index, or this holiday menu, or the holiday section of FindingVegan.com or other amazing recipes online. But this year, I have to suggest this recipe, I made it last week and after one bite I was swooning. 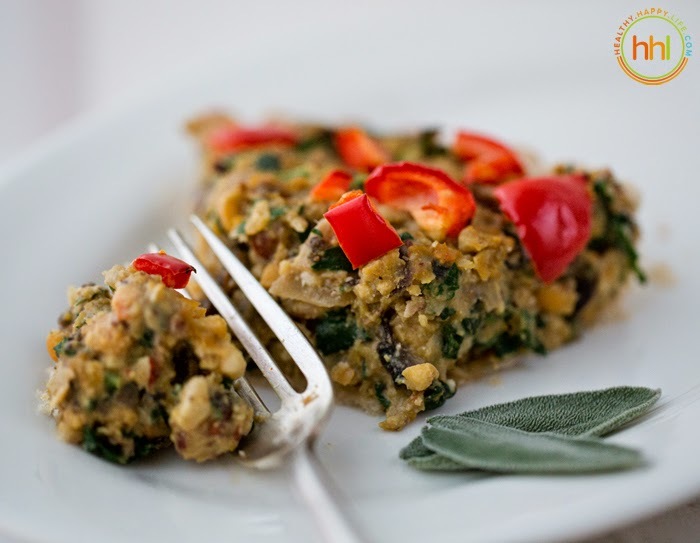 With green veggies and red pepper on top, this Christmas-y recipe is your vegan main dish solution to holiday feasting!.. Holiday Tarts. I adore pot pies and tarts for main dish entrees. They are elegant, easy to serve and make-ahead approved! You can easily slice them like pies and serve to guests in an elegant way. 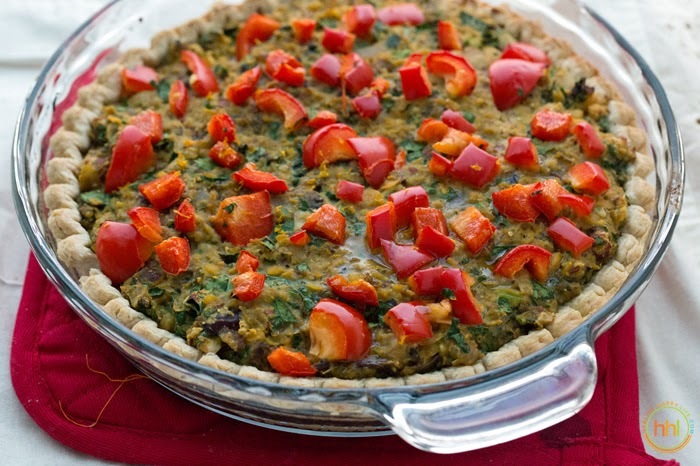 I have long loved Dreena Burton's famous holiday chickpea tart. I send that link to friends and family all the time. 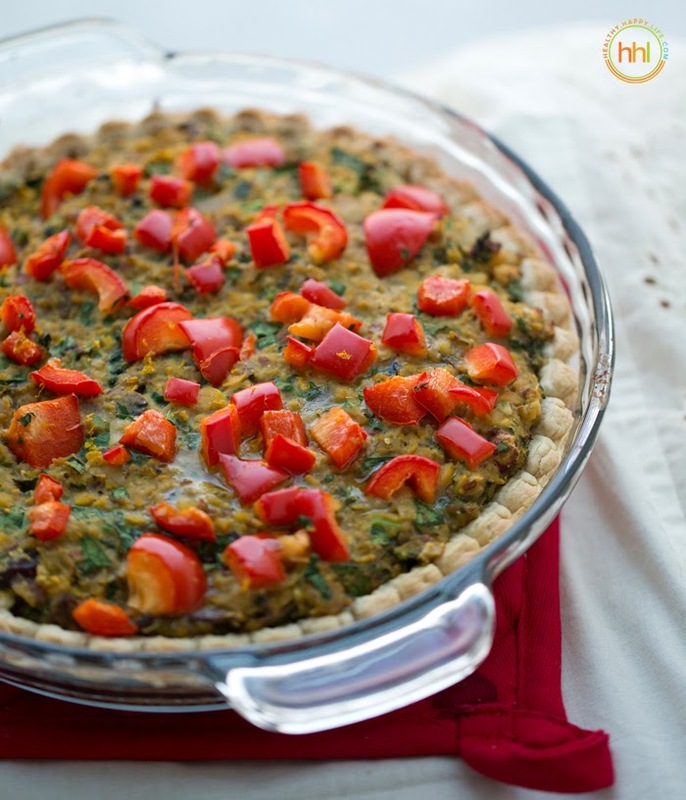 So I decided I wanted to make my own amazing vegan tart-style main dish for the holidays. And boom, a new menu tradition was born. The Flavors. Mushrooms. Sage. Rosemary. Citrus. Medjool dates. Chickpeas. Hazelnuts. Parsley and kale. Peppers. And savory nooch! This tart is ah-mazing. An overflow of flavor in each bite! Dive in this Christmas.. 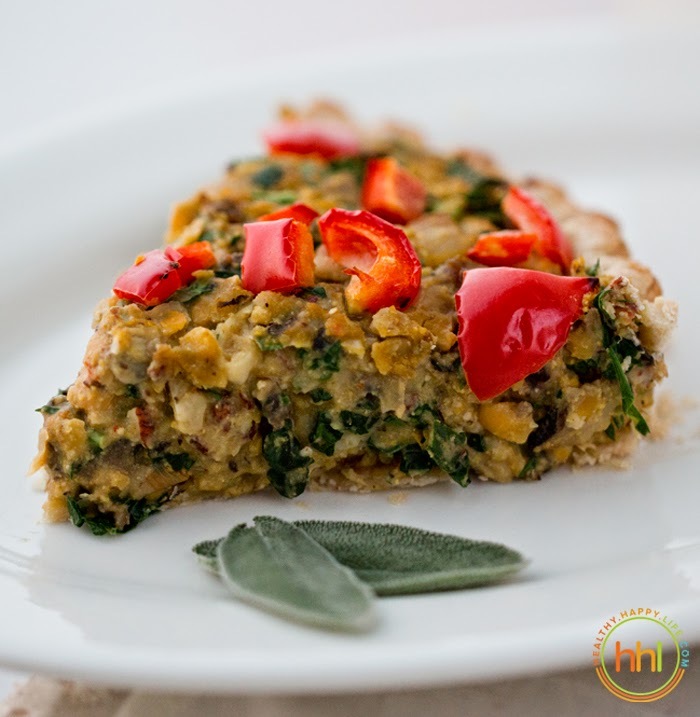 This festive and super-delicious vegan tart is perfect as a Christmas, Thanksgiving or any day main dish. 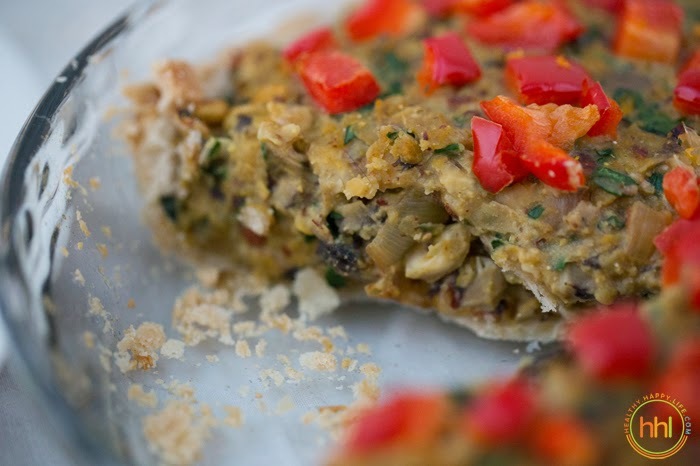 Festive flavors of sage, rosemary, mushrooms, hazelnuts, dates and red peppers. Easy and amazing! Flavorful entree for everyone. Preheat oven to 425 degrees. Pre-cook pie crust in 9" pie dish for about ten minutes in a 425 degree oven. Remove lightly browned pie crust from oven and set aside. Start on your tart filling. Warm a skillet over high heat, add 2 tsp olive oil. To the skillet, add mushrooms, onion, sage and rosemary. Saute until browned, about 3-5 minutes over high heat. Onions and mushrooms shoul lightly brown and reduce in size, greatly. Fold the salt, black pepper, cayenne, nutritional yeast and parsley into the mushroom mixture. Turn off heat and set skillet aside. Lightly toast the hazelnuts in a hot skillet for 2 minutes. Then, in a food processor or Vitamix, process the hazelnuts until they are coarsely chopped - pulse for about 5-10 seconds. Pour into a large mixing bowl. In the same blender, process the chickpeas until coarsely chopped - pulse about 5-7 seconds, you want a nutty and slightly "soft" texture. Pour beans into the same large mixing bowl with the hazelnuts. Add the orange juice, veggie broth, dates, kale and corn meal to the large mixing bowl and fold the ingredients together. Add the mushroom skillet mixture to the chickpea-hazelnut mixture and fold everything together. Stir for about a minute. Pour this filling into the pie crust and pat down to smooth tart. Add the red pepper over top. 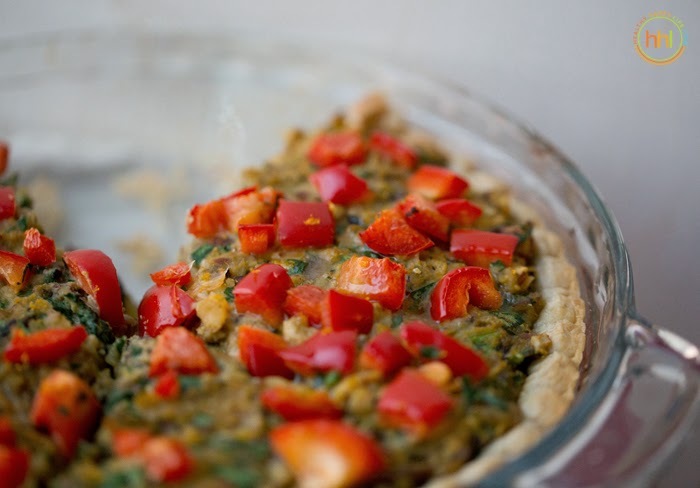 Optional: Drizzle some EVOO over top before placing in oven for extra rich tart! You can also grate some more orange zest right over top the tart. Bake tart at 425 degrees for 22 minutes. This is for a moist texture. For a drier texture, bake for another 5-10 minutes. 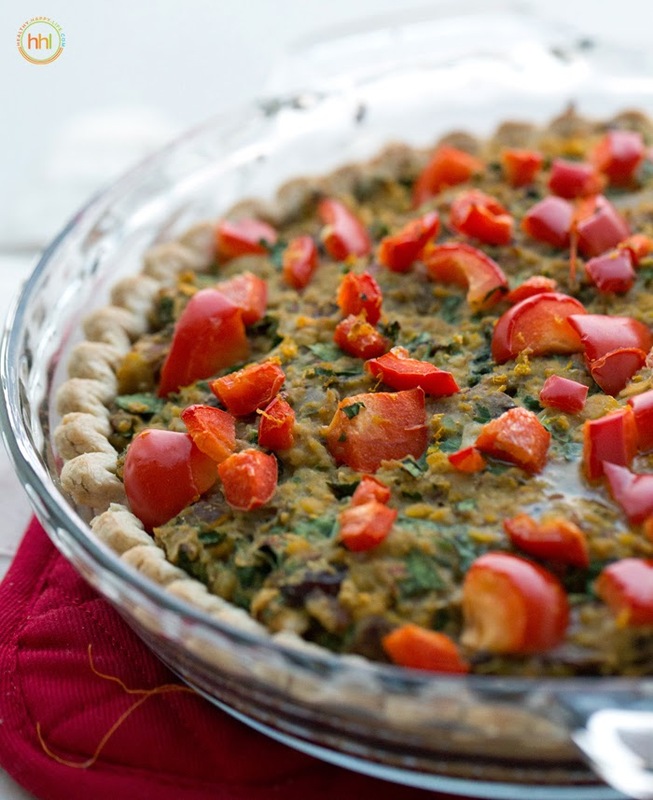 Allow tart to cool for at least 15 minutes before serving, it can cool for up to a half hour. 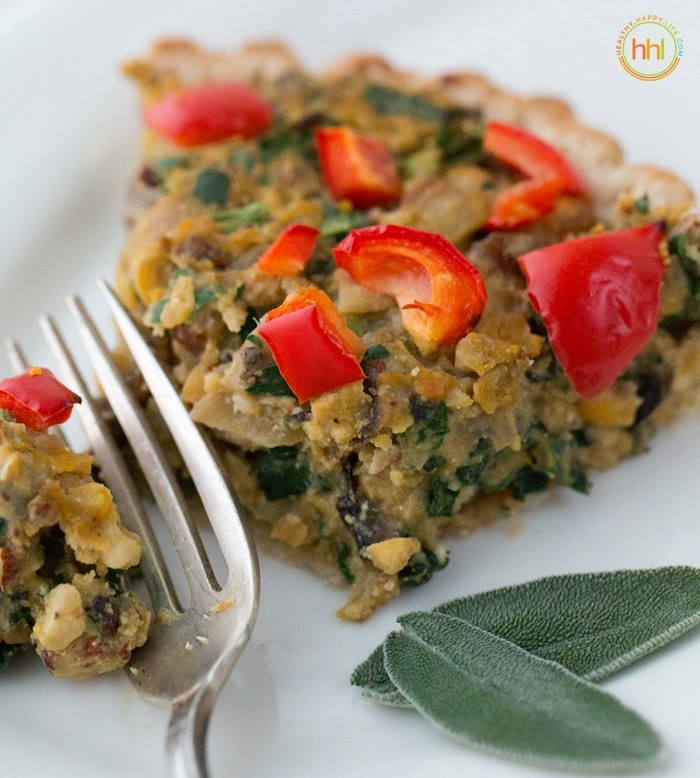 Make Ahead: You can even make this tart ahead of time! Bake as above and store covered in fridge until needed - simply warm in a 400 degree oven for 10-15 minutes to reheat. Or serve chilled.